So not being able to find canned pumpkin last week, what's the next best thing? No, I'm not roasting a whole pumpkin and then pureeing it, as much as that sounds like a fun "little house on the prairie" moment, I will pass. The next best thing was pumpkin butter! The pumpkin butter at Trader Joe's is pretty good, a little too sweet for me, but it's ok.
And it's cheap...let's go with that. This creation came about after I asked on my Facebook page: pumpkin-chocolate chip cookies yeah or nay. And a lot of you said yeah BUT not cakey. So off I set to create a "crunch-like" pumpkin cookie. And one of you said pumpkin powder! Where can I find pumpkin powder? 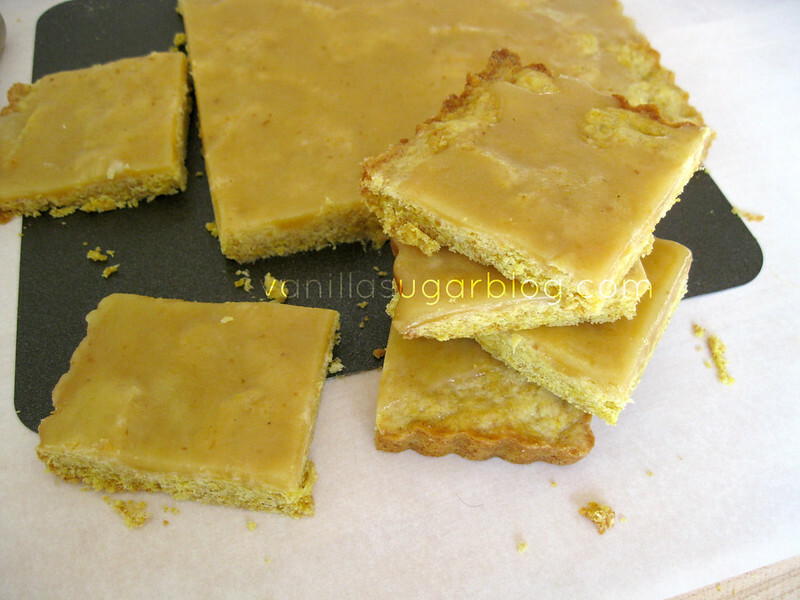 These pumpkin butter crunch bars are based on the VERY popular ginger crunch bars. Do I even have to tell you how good they are? Let me put it to you this way: almost everything I create I give away to friends and family. his own pasta BY HAND--no machine!). When I dropped these bars off everyone in the office huddled around the plate like a buffalo stance, making those sounds of "ohhh and ahhh and whoa...". Secretly? 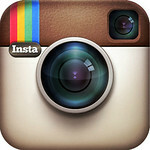 I love, and I mean love to hear the resounding voices of people in love with my creations. It's literally what drives me to create. There were I think 12-15 bars on the plate? In five minutes they were all gone. One bowl easy? Meh, pretty much. 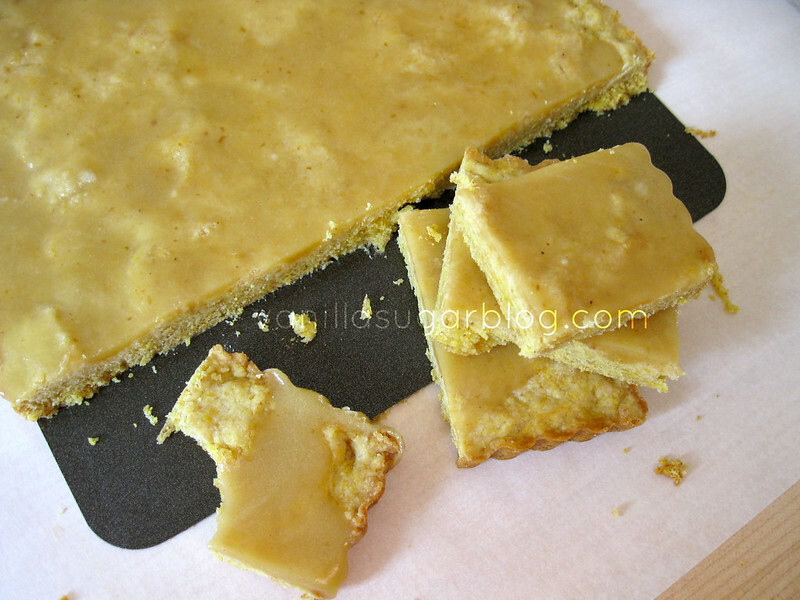 This could also be called pumpkin shortbread, if you doubled up the dough and made it thicker. A little of this stuff goes a long way....it's strong. Don't panic when the dough is crumbly, just go ahead and push it the pan! Icing is strong too, so I only used half (see cook notes). I used an 8-inch tart pan with removable bottom. You could use another size tart pan with removable bottom. For me, the icing makes a lot, I just wanted a little bit of icing, so I only used half and saved the rest of the icing for pumpkin scones! It keeps perfectly in the fridge, covered, for a week. I can’t remember how much pumpkin butter I used in the icing; it was either 1 or 2 TB. So use 1 TB, taste it, and see how you feel and go from there. 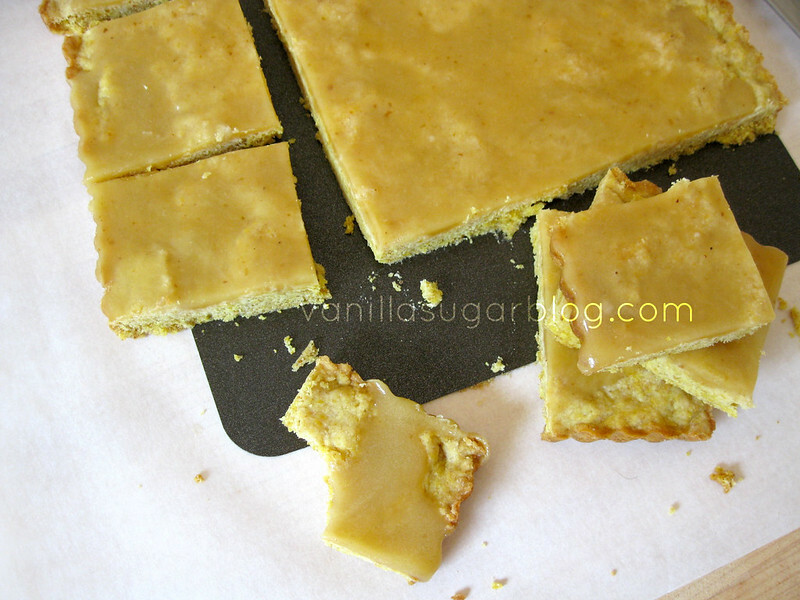 Butter and/or spray up a 8 or 9-inch rectangular tart pan with removable bottom. In a separate bowl, sift the flour, baking powder, and salt. Mix the dry ingredients into the creamed butter mixture until well combined. 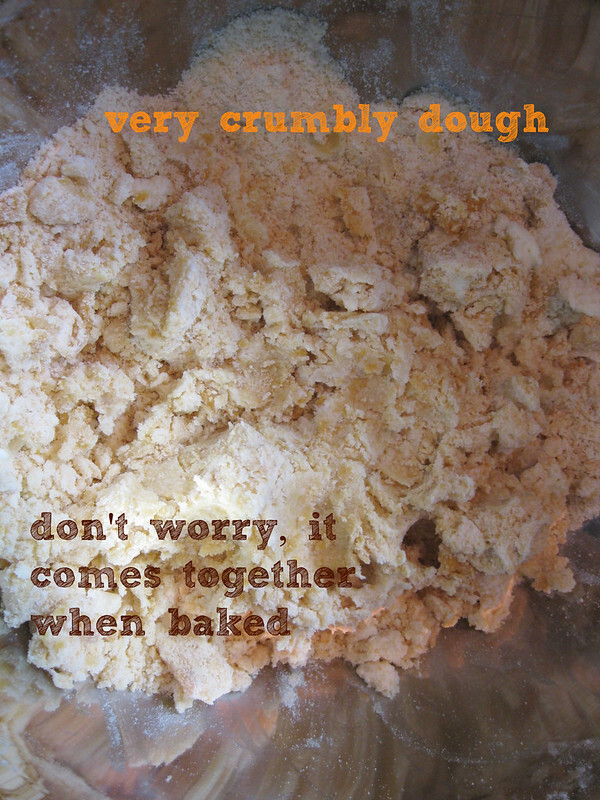 The dough will be very crumbly! This is fine. 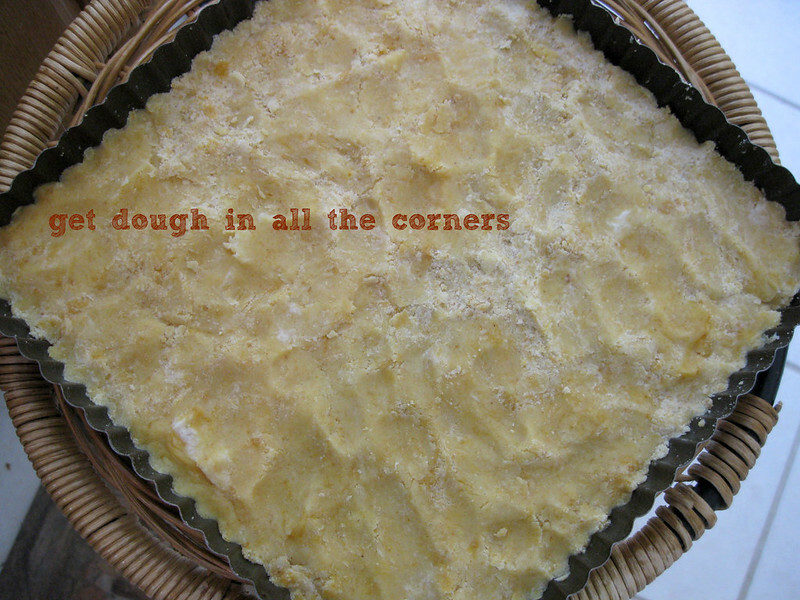 Turn the dough out onto the pan and spread it out, making sure to get into all the corners. Stick the dough in the fridge for at least 15 minutes before baking. When ready to bake preheat the oven to 375ºF. Bake the dough for 18-20 minutes, until it’s light golden brown or if you want really crunchy then golden brown -- I did somewhere in between. When the dough is almost done baking, make the icing by heating the butter and golden syrup over low heat in a small pan; add in the powdered sugar and pumpkin butter. Keep stirring until it’s all smooth. Do NOT let this boil, take off heat when everything is nice and combined. Once the dough is done baking pour the icing over the top (I used about 1/2 of it). When smoothing out the icing try not to let it get into the edges. You want the edges to be seen as it gives a nice decorative appeal when it’s all cooled. Let this sit for at least 30 minutes to let the icing harden up/set up. If your kitchen is hot, then pop in the fridge. 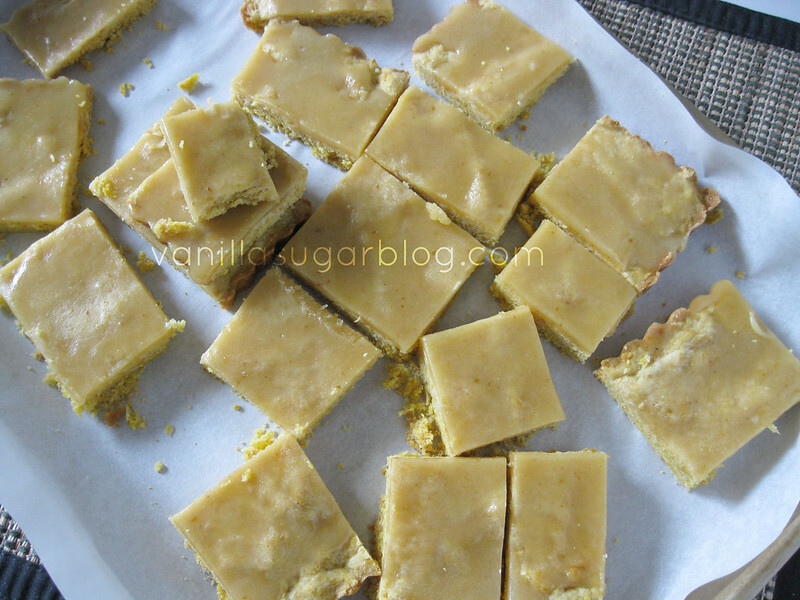 Use a sharp knife to slice into bars or squares. Ok, we do not have a Trader Joes and I am pretty confident I will not be able to find pumpkin butter anywhere here. 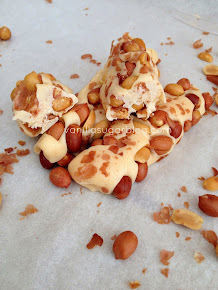 How can I make these with the canned pumpkin instead? Hmmm. Maybe cook some pumpkin pie puree down with a bit of honey? Phuleaze...tell me you ate at least a little tiny piece? It looks fabulous! LOL! I did have half of one for taste-testing! Ok, so how cool would it be if we were neighbors/coworkers? All the potential swapping! These bars look amazing!! Not too traditional, but still autumnal. 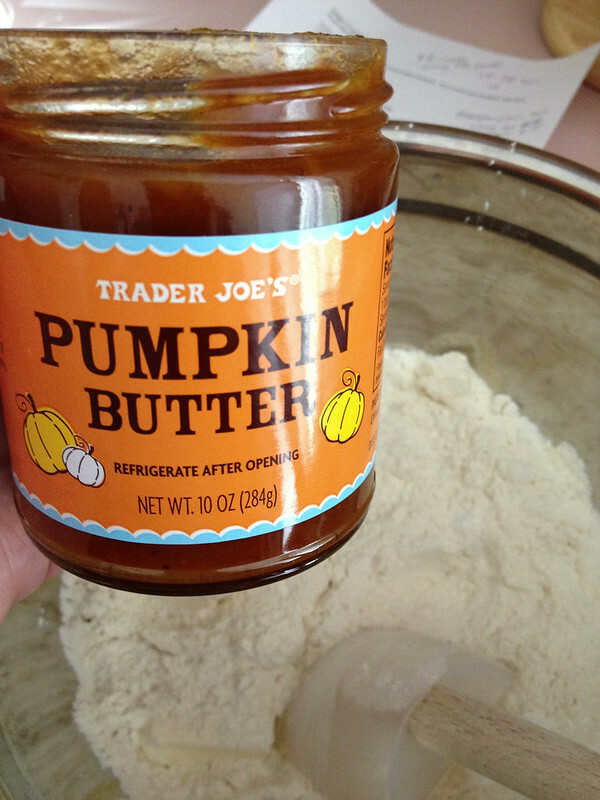 Trader Joe's pumpkin butter is the best, I need to go buy some now that it is in stock:-) These sound awesome. oh my gosh, amazing! love this idea. and i also bake for everyone else :) i mean, i usually like it, too, but seeing how excited people get is really what it's all about! Little House on the Prairie moment. Ha ha. We, I, have those moments a lot. Today I posted home made ketchup. Ha. Yup and I still visit your blog because I think you rock the dessert world! Cleaning and roasting a pumpkin is a LOT of work. I just made a couple of pumpkin pies last w/end. Ate almost an entire one by myself! I can never figure out what to do with that pumpkin butter because it's good, but you're right - way too sweet to just eat! Love the idea of using it in these bars. And pairing it with shortbread. Swoon. Yummy! I am craving pumpkin. I just wish it felt like fall here. Those bars look wonderful! A great fall treat. Okay, so I'm the crazy girl that always roasts her pumpkin and purees it and I love it but it's definitely a bit of a pain.. These bars look sooooooooo yummy. 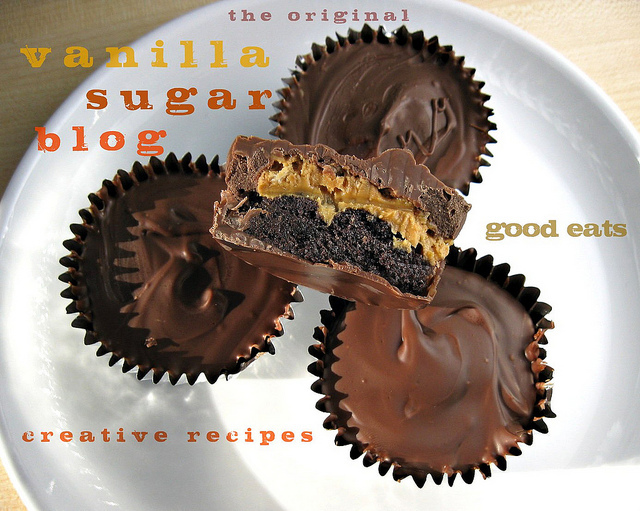 I need to make them! Can I make this in another kind of pan? I don't have any tart pans with removable bottom. 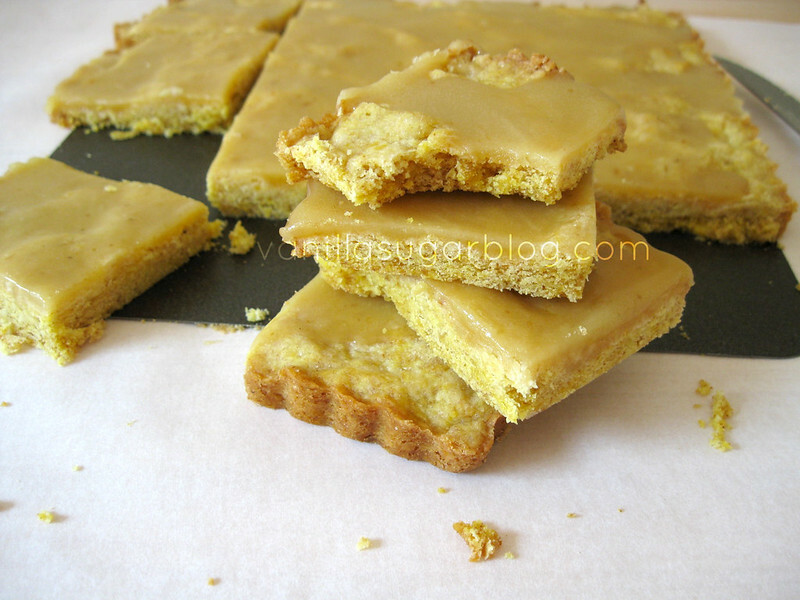 By the way I just bought and received golden syrup specifically for this recipe! Have no idea! You can try an 8 or 9-inch brownie pan, just line it with parchment paper and baking spray! It might not be as crisp though?!?! Gorgeous! These look sooo good. Thank you so much for this crowd-pleasing crunch bar recipe. Very grateful, too, for the intro to pumpkin butter. I hope there's some left at TJ's. There may be a rush on the product after everyone reads your post! Yeah, what's up with the no pumpkin every year? I've looked and looked. Usually have several cans (as I've learned my lesson) but last fall, I moved and didn't give it a thought. Chan, from Chan Knits, can get it all year round. She even offered to send me some. Now that's a good blog friend. 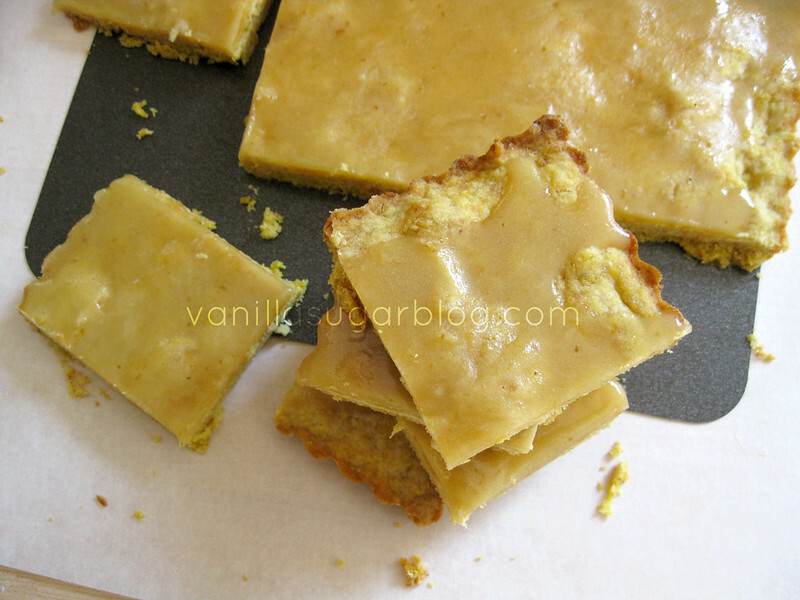 Pumpkin butter would be a good substitute and your bars look divine. oh goodness, these sound perfect!! pumpkin butter is so good. My husband got me a jar of pumpkin butter from Williams-Sonoma for my birthday (he knows me so well!). I can't wait to use some of it on this recipe! 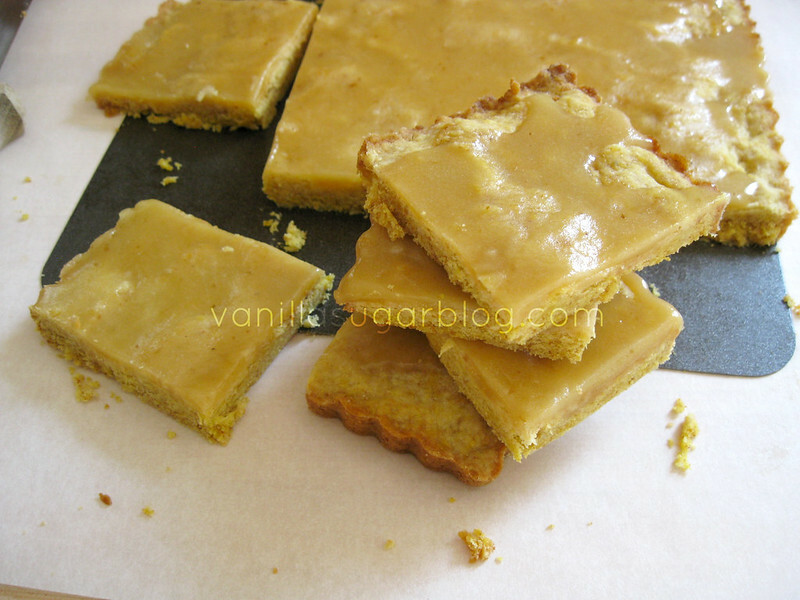 Oh my gosh, pumpkin butter crunch bars sound awesome! I can imagine why they were gone in 5 minutes :) I also love it when people collectively appreciate my creations. Huddled like buffalos made me laugh! must get myself to trader joe's asap!!! great creation! Another great pumpkin recipe! I also enjoy making the pumpkin butter at home! I had to laugh at the bake and puree comment. I was reading a Pumpkin Smoothie recipe with my seven year old. He thought it sounded good, but was bummed because it called for canned pumpkin and he knew we don't have any. I told him we could just use our own pumpkins. I picked 60+ pumpkins this week from the garden. Baking and pureeing them is just part of my regular life. :) Of course, now I need pumpkin recipes to use up all the pumpkins! I found this looking for a Pumpkin Butter Recipe, so I'll need to whip some up after I get the PB made. This looks delicious!